Staying away from a city (read as a source of interesting entertainment) usually creates an exigency of freaking out completely, so one needs to search out for places you could hang around. Even the big Internet world has its virtual limitations .I had already cut off ‘nearby cha-cha’s & bua’s places’ long back (no offences..!!) as it eventually increases the ‘i-wanna-g0-home’ craving in me, fact & very true. 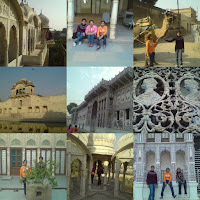 So when Shilpi suggested visiting some “actual Rajasthan” around us, I agreed the very moment. Instant assignments, surprise quizzes, unpredictable happenings have really increased our quickie planning power well. So all dressed & packed 4 of us put on our tourist’s shoes all the way to interior rural Rajasthan-Fatehpur , mind you not the famous Fatehpur-Sikri of UP . Fatehpur happened to be a beauteous small town of exquisite havelis (the royal big houses of rich merchants dating back to even the silk route).Some of them even being renovated by a French group we could meet .The grand bawri’s though quite abandoned quite like the ones shown in movies & of course we couldn’t spot much of ghosts around as the tales go. Camels, vivid local colors & most of all the hospitality of people around completed our package thus creating another great memory. keep up the good work,girl. Its been nice reading you. Could we feature/reproduce your Fatehpur post on Freespeech?